So far we've only seen one good picture of Russell Crowe and a look at the sets of Darren Aronofsky's biblical epic Noah (though some stunning photos surfaced and was taken down), but a trailer is coming soon. We're not sure when, but Entertainment Tonight (via The Film Stage) has unveiled a quick tease of the trailer (thankfully, none of their airhead hosts are talking over it this time) showing us about 20 seconds of footage. There's some gorgeous photography here, but the tease doesn't give us a glimpse of any other cast members like Logan Lerman or Emma Watson just yet. You can now see the first two trailers here. In Darren Aronofsky's take on the Biblical tale, Noah (Russell Crowe) suffers visions of an apocalyptic deluge, and takes measures to protect his family from the coming flood. Paramount/New Regency are behind the project, being produced by Aronofsky & Protozoa Pictures partner Scott Franklin with Mary Parent. Darren Aronofsky & Ari Handel wrote the script, with a revision by John Logan before production. The cast includes Emma Watson, Logan Lerman, Jennifer Connelly and Anthony Hopkins. 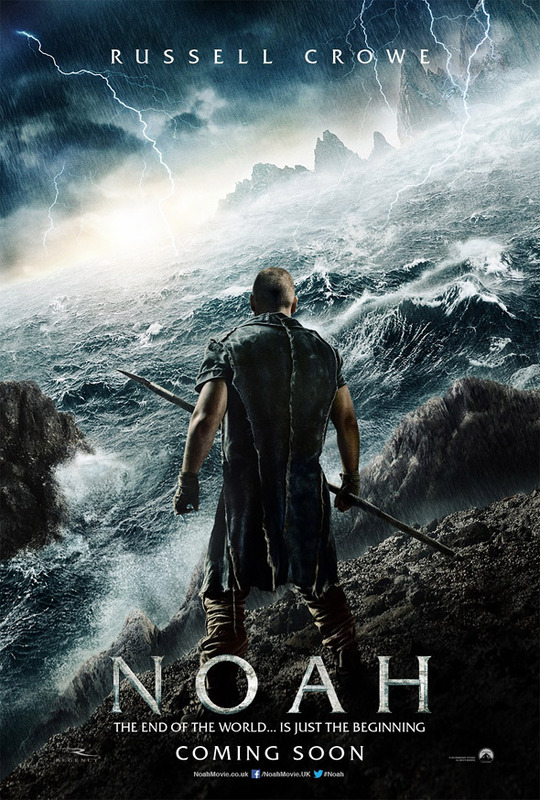 At this moment, Paramount Pictures has Noah scheduled for release starting March 28th, 2014 next year. See the trailer. This will be Crowe's Waterworld. The parallel between two films you draw is hard to swallow. Waterworld was a solid bomb, but more than that, it was a vanity project by Costner essentially directed by his go to guy, Kevin Reynolds...and the film bombing permanently tarnished both their careers and hurt the studios...and mostly just proved it wasn't a good for cost reasons to actually shoot on water. This is an Arronofsky film, which already has art house credibility because of his previous work and will most likely be seen by a ton of religious and non-religious people because it's a story that really has never been told before like this on this kind of epic scale. The story of Noah is one that is nearly universal, Muslims, Christians and Jews all have it in their religious texts...that kind of saturation bodes well for the international markets. On top of that , no matter Crowe's icon status, he has never really enjoyed the same hit making that Costner did before Waterworld...and Crowe really truly has only one major classic under his belt with Gladiator and that was more than 10 years ago. Some might say he has very little to lose and a lot to gain by taking on a role like this, which could so easily slide towards overly theatrical camp....but that is very similar to the movie, Gladiator, that made him a star...I'd say the stars are in perfect alignment for this movie to be a megahit. We'll see. I hope is a success simply because I like Crowe, but it feels like a saddle epic that simply doesn't have enough story. Now if they looked more at Gilgamesh and made less of a impractical giant ark, grounding the biblical story would have been cool. I've just realised that this is looking like 2012 but the fact it's using Noah is to make it more appealing. can someone tell me what's this movie really about? some flood? Yeah. The Epic of Gilgamesh? Probably never heard of it. Saw a really good quality cam of the trailer online, it looks pretty amazing. Probably won't be as good as the book. The bible does not say "species" it says 2 of each 'KIND" IE 2 birds, 2 equine, 2 K9s, ect from those pairs the world repopulated via adaptation. I'm currently a theist but I don't see why this can't be a great movie. It's one of the greatest stories ever told. Are you saying you are a "theist" or an atheist? I know you wrote you are a theist, are you just saying you believe in a god or gods just not the christian god? I call myself a theist because I draw inspiration from many world religions, my personal beliefs change frequently. I also accept and acknowledge a strict scientific approach for creation as a highly likable possibility. I simply do not believe we as humans have the capacity to understand a creator, if one exist, so I wrestle deeply with blind faith and choosing to believe out of fear, instead I acknowledge and accept many possibilities as plausible, including singular or multiple Deities. My religious philosphy is much like the stoic philosopher Aurelius who said in his Meditations, "Live a good life. If there are gods and they are just, then they will not care how devout you have been, but will welcome you based on the virtues you have lived by." I try to live a good life and do what I feel is morally right. Right on, wasnt meaning to attack or anything was just curious. The "Leaked" trailer for this movie was a lot better than this teaser, I feel, search for it online if you haven't seen it. I have to applaud you for using the word "theist" correctly. I study Christian Apologetics and watch a lot of debates between Atheists, Theists, Naturalists, and Christian Apologists. It's refreshing to read someone who has some study on the subject. That being said, I could recommend some good books to you that cover the subject, but I'm sure you must already do the same. Good post. Please do, always looking for books. thanks for the comment. Where the Conflict Really Lies: Science, Religion, and Naturalism by Alvin Plantinga and A Reasonable Response by William Lane Craig. You'll find that your belief will be less blind faith and more reasonable after reading those. That isn't to say, it will be solid, concrete, and without opposition, but that is also life: everyone has a philosophy and an opinion despite the best evidence. Both doctoral scholars present good arguments. They also do a fine job of presenting the other sides POV, unbiased, and then presenting the other side in a well presented, easy to understand format. Best wishes to you. I admire your journey. I have been for years, and will always be, an atheist and looking forward to this movie. what does that have to do with it? this is a fairy tale. biblical fairy tale, yes, but that's mostly what's in there. that's like saying "i don't watch disney because i'm christian"
Well a lot of people are bashing this movie just because of it's Christian heritage, all over the internet. I was attempting to say that it's possible to enjoy a movie even if your faith is different from the one portrayed in the film. Teaser was meh, but Still very excited for this movie. I do hope they keep it biblical and not re-frame why the flood is happening. The footage looks amazing, but that poster is straight cheese. Why does that poster look like they're trying to sell Percy Jackson? Russell Crowe is going to beat that water to death with his own hands. Remember watching the leaked trailer and seeing the line "The most remarkable event in our history" and just laughing thinking they needed to add "That never actually happened". Oh Hollywood, you entertain me. I hope this turns out good. Who is cast as 'Deacon'? Wasn't the last person to play Noah on the big screen John Huston? My only hope is that the story is told from Noah's perspective. Meaning: we never hear the voice of God, but see Noah react and respond as if he hears Him. If you remember there was a trailer earlier this year that somebody got from a festival and it looked terrible hopefully they have retooled it.